Well, I promised Katherine (and extracted a promise from her) that we would keep each other informed of our thrifting finds even after she moved. Now that she is living in a city a ways away it isn't as easy to ooh and aah over each other's finds. I mentioned in an email to her that I had "scored" at our favourite thrift store and was prodded to show my find. I couldn't resist these. I often do pass up vintage sheets but after seeing all the cool things that Katherine makes with them, and thoroughly enjoying a pair of the pj pants that she makes with them, I just couldn't leave this set in the store. They might end up as pj pants, shopping bags or even a quilt. My friend, J, mentioned that I could just sew the two sheets together with batting in between, machine quilt it and...voila! A bright, pretty, easy quilt. Sounds good to me. 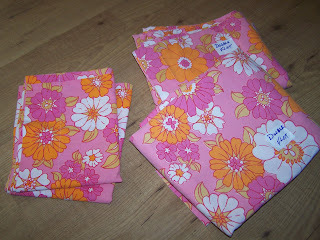 (the problem is that I have such a hard time cutting into them so I hem and haw about how to use them). Thank you so much for showing me such an awesome find! Wahoo! Those are so beautiful. I love the vibrant colours. I think they are screaming out to be a pair of pj pants. I love those pink sheets! 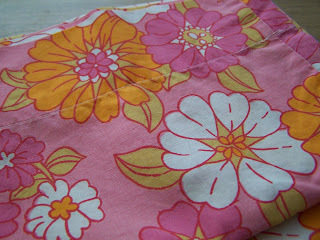 I had sheets with the same flower patterns and colour when I was 6 or 7 years old in Fairview, AB. I loved them! I have never seen sheets like them since so it is so neat to see some on your blog! Whatever you make with them, will be very pretty!